Kalimpong. Mukesh Sharma: 10 marathon runners from the Darjeeling hills will take part in the Standard Chartered Mumbai Marathon 2016 on January 17, thanks to the untiring effort of Roshni Rai, an amateur marathoner who is a corporate lawyer by profession, whose dream is to produce an Olympian from her neck of the woods. Rosni, who hails from Pedong, about 20 kms from here is facilitating the participation of the 9 marathoners under her “Run with Roshni” banner to showcase the potential of athletes from the hills. 8 will be running the half-marathon in the upcoming Mumbai run while two will run the full marathon.A team of 9 member today Left Kalimpong for Mumbai. 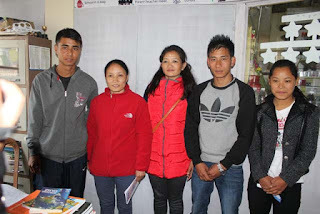 Premika Rai and Roshni Rai will take part in 42 Kms Full Marthon while Sarwasti Rai, Ashika Rai, Adipa Rai along with Ranjit Rai , Bikram Thapa , Binod Tamang , Sanjay Rai and San Kumar Darnal will run the 21 kms half Marathon. With a logo " We are Gorkhas Proud to be an Indian" we are hopeful to perform better informed Premika Rai. The Team had organised a Marathon on 1st of May 2015 to extract talent and giving them national and International stage . Winner and top two was trained to participate in coming edition of Mumbai Marathon . Adipa Rai and San Kumar Darnal who won the May 1st Marathon will be running with elite runner from all over the world.